Cotton Sport has finally allowed their key striker ,Edgar Salli to join French division 2 club, Monaco on a 3 year contract. The prolific player was named player of the tournament at the South Africa 2011 junior tournament. He is currently part of the Cameroon U20 team currently fine tuning in Venezuela ahead of the 2011 Fifa U20 World Cup scheduled for July 29 to August 20 in Colombia. Remember, Cameroon lost to Nigeria 3-2 in the final of the African Youth Championship held in Johannesburg last April, but despite the loss they qualified for the junior World Cup alongside Nigeria, Egypt and Mali. World’s football governing body, FIFA has finally settled the dust concerning Charles Itandje . The former Lens goalkeeper of Cameroon descent can now play for the Indomitable Lions . 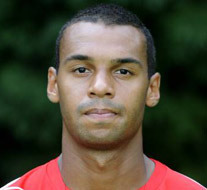 Itandje was born in France and has represented France with the U-23 team. 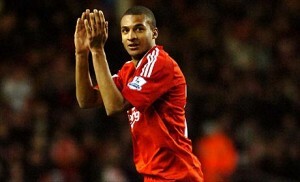 He currently plays for Greek Division 1 side , Kavala on loan from Liverpool. The Indomitable Lions yesterday beat Mauritius by 3-1 at the Anjalay stadium, in Northern Mauritius in a match for the qualifying group stage of the 2012 African Cup of Nations. 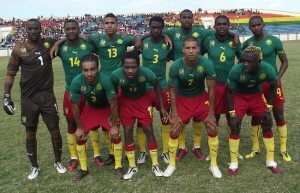 Cameroon largely dominated the match infront of about 6000 spectators. Eto’o opened the score on the 37th minute of the game while Mauritius equalized on penalty at the 45th minute by Jonathan Brut. Eto’o added a second goal at the 47th minute and Moting scored the third goal from the penalty spot at the 64th minute of the game. Senegal and Congo are the two other teams in this group. Cameroon comfortably takes the first spot in the group while waiting for the outcome of the match between Senegal and Congo on Sunday. OFFICIAL: Javier Clemente confirmed as Cameroon Coach and Omam Biyik to assist. After the Lothar Matthaus confusion and controversy, Former Spanish and Serbian Coach , JAVIER CLEMENTE has been confirmed to coach the Indomitable Lions of Cameroon for two years renewable. The official contract shall be concluded on the 28th of September 2010. 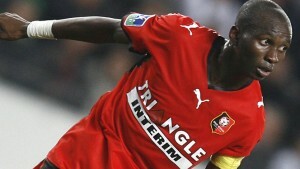 He shall be assisted by former Cameroon international footballer , Francois Omam Biyik. Jacques Songo who served as interim coach against Poland retains his position to coach goalkeepers. Javier Clemente replaces Paul Le Guen whose tenure of office was marred by several humiliating defeats before and during the World Cup. This information initially published by several medias like Espangnol Marca, France Football, L’Equipe, and others has been confirmed by the Ministry of Sports. A serious injury in 1971 ended his playing career. Before that he had won the Spanish Cup in 1969 with Athletic Bilbao. As a coach, he won the championship twice in Spain with Athletic Bilbao in 1983 and 1984. He remained the youngest coach to win La Liga. In 1988, he led Espanyol in the final of the UEFA Cup. Javier Clemente has been national coach of Spain between 1992 and 1998, and Serbia between 2006 and 2007. During the 2000-2001 season, he led Olympique Marseille. In April 6th , 2010, he was appointed coach of Real Valladolid replacing Onésimo Sánchez. • Spanish Cup : 1969. • Spanish championship: 1983 and 1984. • Spanish Cup : 1984. • Spanish Super cup: 1984. • UEFA finalist : 1988. • Don Balón for Best coach in la Liga : 1983, 1984 and 1987. All we wish is the best for Javier Clemente as head coach of the Indomitable Lions. The Indomitable Lions whose reputation was dragged in mud after suffering a series of defeats before and during the World Cup are now back on track. 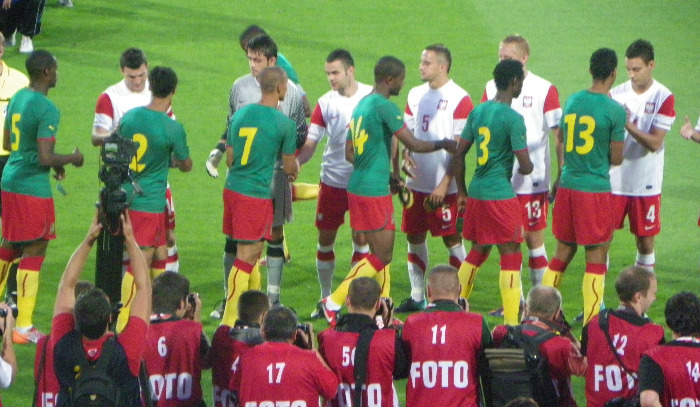 Cameroon beat Poland at Szczecin 3-0 . The interim coach Jacques Songo decided to line-up Sebastien Bassong, Nkoulou, Assou Ekotto and Binya at the defence, Bedimo, Chedjou, Makoun and Marcel Ndjeng at the midfield, and Choupo Moting and Samuel Eto’o as attackers. 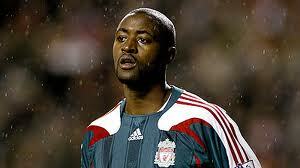 N’dy Assembe was given an opportunity to constitute the first 11 squad as goalkeeper. With a prolific midfield and fluidity in delivery, the Lions created so many scoring chances. The Inter Milan striker , Samuel Eto’o scored in the 30th and 52th minutes , with the Valencienne new-comer , Vincent Aboubakar completing the scoring in the 85th minute with a terrific strike after displacing a Polish defender . The result was a blow to Poland, which suffered its fourth defeat in a row. Poland and Ukraine are to co-host the European Championship in 2012. Cameroon goalkeeper Kameni Carlos whose name was apparently omitted to be part of the team to confront Poland in a friendly match on the 11th of August has accused Samuel Eto’o for influencing the selection of players in the National team. According to Jacques Songo’o , the interim coach and signatory of the 22 shortlisted players, he did not call Kameni because he wants to give an opportunity to other goalkeepers notably Guy-Roland Ndy Assembe. Kameni who has been consistent for about 8 years in the National team was very disappointed to watch the World Cup in South Africa unravel on the bench as a substitute and points his finger at the National team captain for his non-selection. Rumours say the relationship between Samuel Eto’o and most of his teammates was filthy during the World Cup in South Africa. Eto’o writes an open letter to Rigobert Song. The news about your retirement from international career reached me during an Inter Milan training session in the United States . Though this announcement is not a surprise, it deserves more attention. In 1998, when I arrived amongst the Indomitable Lions, I had the pleasure to mix with seniors like Patrick Mboma, Marc Vivien Foe, Raymond Kalla and of course you. These are the moments that are remarkable to any young player and I have very fond memories . Rigobert, you do not deserve to go by a simple press conference. We who have been teammates in the national team with you are calling for a more solemn retirement. You will surely hold a jubilee when you quit your club career, but the country’s sports authorities should have the duty to organize a tribute game for everything that you brought to our country, well beyond a simple jubilee. …You won two African Cups of Nations, you were finalist in the Confederations Cup, you have participated in four finals of the World Cup, you hold the record for most number of matches played during the CAN, you were captain national team for ten years. Very few people can match such a record with the Indomitable Lions. I … address an open letter because I want to associate all Cameroonians and all those who love football to these few words. Do not forget that you still have to lead Trabzonspor to new conquests during the 2010-2011 season ahead.